If you are a new landlord coping with bad tenants or tenants who are not paying their rent, you may find yourself needing to know how to serve eviction papers in Florida. Florida has specific laws about how and why a tenant can be removed from the premises. It is important that you understand how service of eviction papers works, possible defenses by the tenants, and how to avoid obstacles. The first step in eviction is to serve the tenant with either a 3-day or 7-day notice. A 3-day notice is given for nonpayment of rent. A 7-day notice is given if they are breaking the terms of the lease in another way. With a 3-day notice, the tenant must vacate the property within 3 business days, not counting the day of service. With a 7-day notice, the tenant must remedy the terms of the lease or vacate the property in 7 business days. While these forms are readily available online and can be served by anyone, it is a good idea to have these papers served by a private process server. These initial notices can be mailed via certified mail, left with any adult tenant, or posted to the door. It is important that whoever serves the notice makes record of how and when the notice was served. One common defense to evictions is that the tenant claims to have never received the initial notice. This is why it is a good idea to use a private process server. They can certify that the notice was served in an appropriate manner. 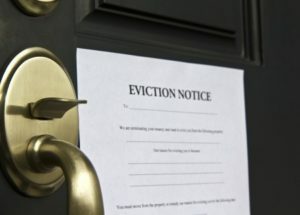 Once the initial notice has been given, if the tenants do not remedy the situation or leave the property, you must file for an eviction with the courts. These eviction papers must be served by a private process server. When you file the eviction complaint, you will have to provide proof that the initial notice was served. This is easy to do if you have a private process server help you throughout the process. If you are a landlord needing to evict a tenant, contact us today to get started. Our experienced process servers can help you get tenants removed swiftly and accurately.